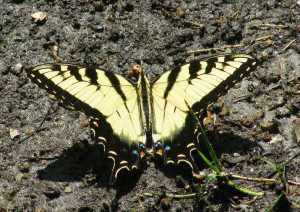 A puddling male Tiger Swallowtail, the state butterfly of Delaware. On July 12, a small group of Delaware Nature Society staff and volunteers hit the field with lepidopteran intent: to count butterflies for the North American Butterfly Association’s annual Fourth of July Butterfly Count. 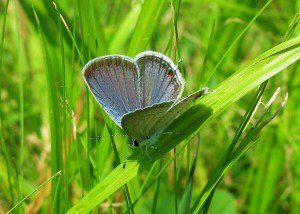 A male Eastern Tailed Blue rests on a blade of grass. Our group, armed with cameras and nets, combed Burrows Run Preserve and Ashland Nature Center to find all butterflies present in order to provide an accurate census as part of the Wilmington Count. Other groups covered different natural areas in this count circle. A "cropped out" photo of Red-spotted Purple at Ashland. 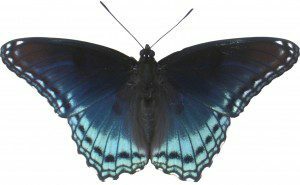 Among the 14 species of butterflies identified, we had some notable surprises. Pearl Crescents, a diminutive orange and black butterfly, turned out to be the most numerous, with 40 individuals counted. Fair numbers of Monarchs (11) and Great Spangled Fritillaries (9) were documented. Little Wood-Satyrs and Common Wood-Nymphs are uncommon species we found. The gorgeous Red-spotted Purple was a favorite find. 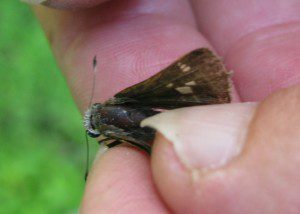 A Little Glassywing, found at Burrows Run Preserve, is held in hand for identification. 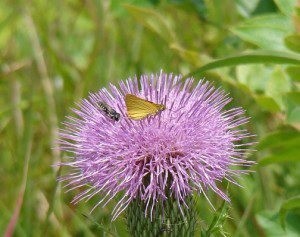 Among the notoriously difficult to identify skipper family, we captured and photographed a Little Glassywing, the first ever documented at Burrows Run Preserve. Only by photographing the skipper and studying images in a butterfly field guide could a positive ID be made. “Citizen Science” like the Fourth of July Butterfly Count is valuable in building up an accurate picture of animal populations across the U.S. This year’s Count, for instance, reinforced the notion that 2009 is an “0ff” year for butterflies in northern Delaware (probably due to the very chilly, rainy spring). What better way to have fun and contribute something useful at the same time? Last week, I shot some videos of wildlife at Ashland Nature Center, Mt. Cuba Center, and the Bucktoe Creek Preserve. The Sharp-shinned Hawk segment is of one of the adults from the pair that raised two young at Ashland this summer. The young were flying around and screeching last week, and were impossible to capture on video. The Kestrel is the male of the pair that nested at the Bucktoe Creek Preserve and raised two young. Also, notice the very small insect that the Yellow-billed Cuckoo is holding and the downy fuzz on the top of the Green Heron’s head. Enjoy! Earlier this summer, our Herp Hunters camp for 9 to 12 year olds enjoyed a week of herpetiles, herps for short (reptiles and amphibians), and the interesting places that they live. 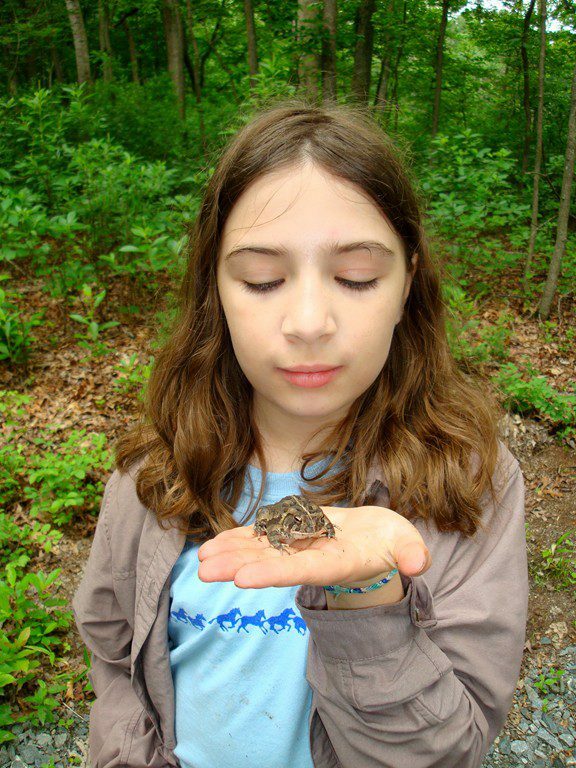 It was not the best weather for herps, without much sun for basking snakes and lizards, but the campers seemed thrilled with the frogs and tadpoles they found everywhere. 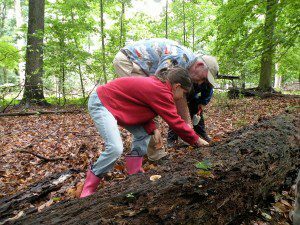 We traveled from the Piedmont sites of Bucktoe Creek Preserve, Ashland Nature Center, and Burrows Run Preserve to the Coastal Plain sites of Blackbird State Forest and Olde Hope Farm on the Chesapeake. We were fortunate to see lots of transforming frogs, especially at Blackbird, where we saw at least 4 different kinds emerging from vernal pools. 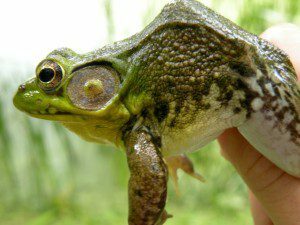 At Bucktoe Creek Preserve, we had our first glimpse at Green Frogs and American Toads. 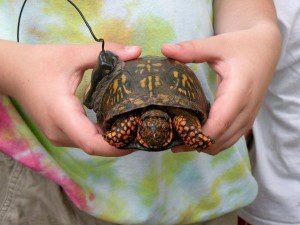 The highlight at Ashland Nature Center the next day was finding the Eastern Box Turtle that is fitted with a radio transmitter. We weighed and measured it and wrote all of the information in the Ashland turtle log. This Eastern Box Turtle at Ashland Nature Center has worn the transmitter for about a year. We tracked it down in its small territory in the woods. We headed to Blackbird State Forest on Wednesday to explore the wet woodlands and a Delmarva Bay, which is a small pond that has water sometimes, and none at other times. Newly transforming frogs were everywhere. We saw very tiny Wood Frogs, Spring Peepers, and Southern Leopard Frogs. Fowler’s Toad, the toad species on the Coastal Plain, was common and we took time to sort out the differences between them and the American Toad, found in the Piedmont. A Fowler's Toad, which is the type of toad you find on Delaware's Coastal Plain. Thursday, we went to Olde Hope Farm near Earlville, MD to explore a pond and forest along the Bohemia River. Mr. Tom Harkins, an entomologist with the US Army, but a herp expert himself, helped us dissect a log. We found lots of Bess Beatles that make tunnels where snakes can be found – the Herp Hunter group that came here later in the week found a group of Worm Snakes here. We missed them! We dissected a log to see what critters live inside. Sarah, my co-leader, and I seined the pond for turtles. The kids gently beat the edges of the pond to drive critters into our net, but other than a tire, we picked up tadpoles…lots and lots of them. 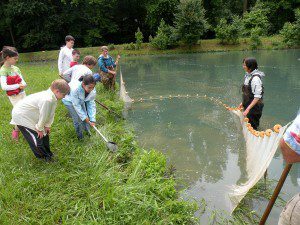 Seining for herps in a pond was exciting! On Thursday night, Nate Nazdrowicz, who has a doctorate degree in herpetology, set a turtle trap for us at Burrows Run Preserve (don’t worry, this trap is only to observe them, not kill them). We met him the next morning to see what he caught. We were pleased to find an Eastern Painted Turtle had been lured by the sardines placed in the trap. Nate also took the group to a small stream and helped them find a Northern Red Salamander and a Two-lined Salamander to add to our week’s list. It was a fantastic week in the field, watching kids get excited about wildlife, and catching lots of things that crawl, slither, hop, and swim. Nate, who is a Herpetologist, trapped n Eastern Painted Turtle for us overnight. We got to weigh it, measure it, and release it back to the wild. Summer camp has been ruling my work life in the last few weeks, and has kept me from blogging too much lately, but I wanted to catch you up on a recent adult trip to Fort Indiantown Gap Military Reservation. Sheila Vincent and I led this trip a few weeks ago into the usually restricted areas of the base. 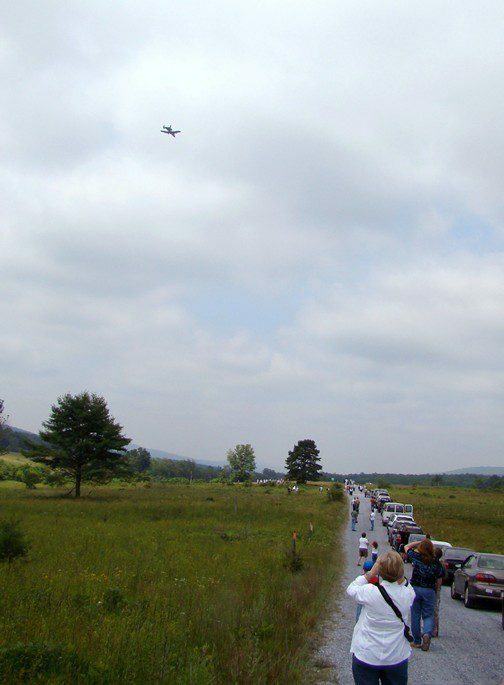 We were not alone, as close to 100 other people decided they would take this guided trip into the base to see the extremely rare Regal Fritillary butterfly. 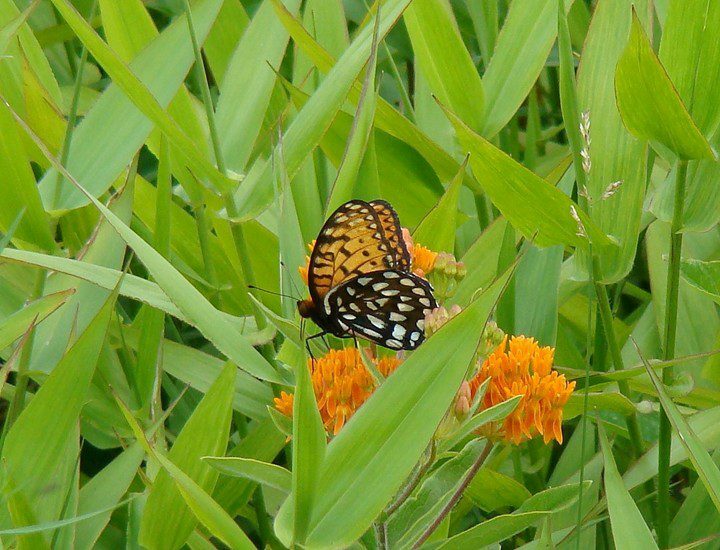 The Regal Fritillary exists in the mid-west and was once fairly common in the northeast, but its range has retracted east of the Mississippi River, leaving this lone colony at Fort Indiantown Gap. Finally, a Regal Fritillary got close and stayed still long enough for a photo! We saw about 30 Regal Fritillary, and they were actually one of the most common butterflies in the meadows we visited, but they were not the only attraction. Several participants in my group were interested in seeing an Aphrodite Fritillary as well, but picking them out among the much more common Great Spangled Fritillary is impossible. Luckily, a staff member with a net captured one and called us over for “in the hand” looks. On this Aprhodite Fritillary, the light stripe on the outer part of the hindwing has a little brown that creeps into it. 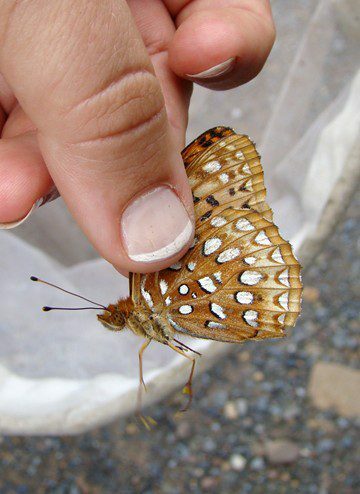 The Great Spangled Fritillary's stripe is all cream colored. Now I know why it is impossible to identify between these two species without capturing one! There were other butterflies in the extensive wildflower meadows of Fort Indiantown Gap, but the numbers were lower than in previous years and included: 2 Delaware Skipper, 1 Black Swallowtail, a few Eastern Tiger Swallowtail, about 20 Clouded Sulphur, 1 Coral Hairstreak, a few Eastern Tailed Blue, 8 Monarch, 75 Great Spangled Fritillary, 30 Regal Fritillary, one Aphrodite Fritillary, 3 Pearl Crescent, 2 Red-spotted Purple, 2 Viceroy, and 2 Common Wood-nymph. Yes, we had to take a 2-hour drive to see a Delaware Skipper! Finally, my favorite part of the trip involved bullets, not butterflies. The pilots practicing their skills flying A-10 fighter jets decided to show off for us, flying right overhead, banking and making multiple passes. With each pass, the pilots fired their guns at 70 rounds per second. In the distance, we saw the smoke rising from their intended target. Impressive! The A-10 jets could have taken us all out in one pass! Thank god we were on their side. 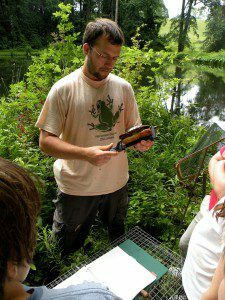 Upcoming programs with the Delaware Nature Society: Butterflies for Grownups – Aug 1; Full Moon Walk at Abbott’s Mill – Aug 6; Dragon Run Full Moon Canoeing – Aug 6; Hike and Happy Hour at Newark’s Cooch-Dayett Mill – Aug 14; Sweet Corn for Every Season – Aug 16; Bird Migration on Delaware Bay – Aug 22; Garrett Island National Wildlife Refuge – Aug 29; Bird Banding at Bucktoe Creek Preserve – Aug 29; August Yoga at Coverdale Farm and Ashland Nature Center. See www.delawarenaturesociety.org for details.